"Most projects begin with blueprints, we begin with a philosophy." 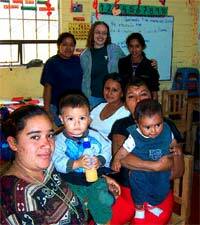 Nearly three years ago we received our first service team of volunteers in Guatemala. Since then we have been inspired by the numerous service groups, which have included: high school youth groups, church groups, Rotary Clubs, sports clubs and community groups. They have come to Guatemala from around the US, Canada and Europe eager to support our efforts! Whether chopping mounds of carrots for our children’s lunches, building furniture for the new early intervention program, or by teaching a skill, such as lacrosse, each group is making a difference in our children’s lives! Service teams, which are made up of 10-15 people, typically volunteer for 7-10 days. The participants have an opportunity to work directly with the children and to gain an understanding of the integrated services which Safe Passage provides. They are also able to explore some of the cultural activities and sites in Guatemala. Jane Hurd, a recent group participant from Boothbay, ME expressed “We were protected and taken care of as a group, the way Safe Passage takes care of its children. We felt like arms were wrapped around us; it’s understandable why the children feel so safe.” If you are interested in learning more about our service trips and how you can participate please contact our Maine office or caminoseguroteams@yahoo.com. This year, thirty mothers and grandmothers, ranging in age from nineteen to seventy four years old, are learning to read and to write! 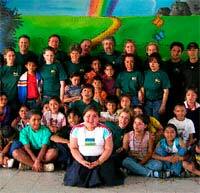 The classes are taught by a local Guatemalan teacher, and by a long term volunteer. Both are passionate and committed teachers who have developed close working relationships with their students. One outstanding example of the success of the program is in the progress Doña Etelvina Perez has made. At seventy four years of age, she had never attended school. After only five months in the program, she is now able to read and write her name, recognizes certain letters in the alphabet, and can do basic addition and subtraction. Many other students with only one or two years of primary education are now reading and writing at a third grade and fourth grade level! They are positive role models for their children and grandchildren, as they show them that with hard work and determination, their goals and dreams can be reached at any age! In January, we successfully sent 528 children to school! Many of the children are the first in their families to receive an education. Your generous donations of backpacks, school supplies, and financial contributions, made this possible. We are all extremely proud of the children’s hard work and determination. Your ongoing support is greatly needed and appreciated, as we continue to work to provide successful educational opportunities for some of Guatemala’s poorest children. Thanks, all, for the good lacrosse last week! Sorry I faded in the last game and a half. I did a good job on my hamstring, despite Dave Barnes warnings. Thanks for the shirts. They are washed and are aimed toward Guatemala. In Guatemala City there is a large dump. Families scavenge in the dump for stuff they can sell. Many make $1.00 a day, which isn’t much to go on even in Guatemala. The smell of the dump is awful. The smell of exhaust is as bad. Cancer levels are high. The health conditions are bad. More than a few kids have skin or hair conditions due to the methane gases. Public education is free, except that each student needs to buy books and a uniform and pay a very small enrollment fee. That is much more than most can afford. Many kids don’t go to school. I hope that our Polar Bear lacrosse team will consider supporting these kids and their lacrosse. We could make a huge difference in the lives of these kids. I encourage you to consider taking your family or your lacrosse team there. I would be glad to help set that up. It is a great experience amid very significant poverty. I underestimated how positive the lacrosse was and can be in their lives. Currently the lacrosse is all “recreational.” We are considering a recreational program and a team with slightly more commitment. I propose that this team be the Polar Bears. I propose that we match Lake Placid Polar Bear with one Guatemala Polar Bear and that we do this by number. So #1 Lake Placid Polar Bear would swap letters and advice on lacrosse with the player with the number #1 jersey, perhaps someone learning to be a goalie. This builds a relationship around a shared interest in lacrosse. Where that relationship goes from there is to up to them. I have jersey numbers 1, 2, 3, 4, 5, 6, 7, 8, 11, 12, 13, 14, 15, 17, 18, and 21. If you would let me know what number you were, your mailing address, and that you are willing to “adopt/support” one lacrosse player on the Guatemala Polar Bear team, I will send them the jerseys, send them a picture of our Lake Placid team, and assign a player to one of these jersey numbers. You will receive a letter, probably in Spanish, from one of these players who will be asking you about lacrosse, and much else I suspect. They need more sticks. Essian Construction has offered to donate helmets, which will be great! They need elbow pads — old or new. They need a field with grass. Someday soon, I would like to take them to a turf stadium in Guatemala City for a game, and bus their parent(s) to watch. (Some kids have Dads; many do not. Few adults can afford drugs, so sniffing glue is a serious health issue for families.) Taking these kids to a stadium would be well beyond most of their dreams and perhaps help them see that lacrosse could move them forward in life. I hope that the lacrosse program will grow year-round for these kids. I hope that we can bring one or some of them to a lacrosse camp in the U.S. someday, which would be well beyond all of their dreams. I hope they can have a field to play on — with grass. For teams going down there to help with lacrosse, we are discussing having the older Guatemala kids teach Spanish lessons to the lacrosse players in return for lacrosse lessons. Not sure what this will look like, but it makes sense to me. I have pasted below something I wrote for a local newspaper. I hope we will stay in touch about this to discuss how you think our team might help their team. I welcome your ideas! This lacrosse program for the children of the Guatemala City Dump far exceeded all of my expectations . . . as did the poverty, the constant smell of garbage and exhaust, the crime, the disease, the despair, the hope, the potential, and the smiles on the faces of these future Guatemalan lacrosse stars who return home each night to a small, dark, metal shack with a dirt floor, a bed or two, disease, violence, and, hopefully, a meal. I confess that after seeing the weight of the poverty that these children face, I wondered on Monday morning whether sports and lacrosse really had a place in their lives. I left on Saturday convinced that it really needed to be part of their life. For Frederico, a Guatemalan social worker with Safe Passage, the goal was to help these children have just one more day of happiness. The lacrosse experience certainly contributed to that happiness. For Hanley Denning and others involved with Safe Passage, the goal is self-esteem. I saw the same smile and the same sense of “coolness” on these kids’ faces that I have seen for 28 years of coaching lacrosse when they show me on the second day how well they can cradle the ball. My goal was and is to help these kids have fun and hopefully to learn a just a few of life’s lessons along the way. They, boys and girls, had a great time playing lacrosse and are hoping to play in Guatemala this week and in the weeks ahead. They wore their t-shirts with great pride. They hated the goggles, which they said were itchy and hard to see through. They have 26 sticks there and will be using them all this afternoon. My other goal was to expand these children’s world beyond the fringes of the dump. The potential is there. Being the only lacrosse program in Guatemala, they have few opponents. Disease and malnutrition are one opponent. Their favorite meal is fried chicken feet or a boiled chicken foot in soup. They get a glass of milk before they leave Safe Passage each day because it may be their last meal. Perhaps our lacrosse program can help them see the value of health and nutrition and fitness. Each of these boys will have an opportunity to join a team in the next few years that will provide support and camaraderie and a purpose. It will most likely be a local gang. Perhaps, our lacrosse team can be a better option. Each of the girls will have the option to be a mother by the time they are 15. Perhaps, this lacrosse program can be another option which builds confidence and opportunity for these girls. I wondered whether the girls would participate with the boys in the lacrosse games. They had no such doubts. Selvin is a small, very quiet boy. He dropped the first pass I threw to him and caught the next ten. He was proud. He smiled. But, he never said a word. He was at my side for the rest of the week. Somehow, he had a sense of how to be open when I needed to pass to someone. He was always there, except when he left the game discouraged because our team was behind. I hope I can help him learn to be behind and to keep trying and to win. I guess he doesn’t do well with loss — something I think he has had a lot of in his life. Any U.S. high school lacrosse coach would look at Mynor and say that with a year on JV, he could be a very good lacrosse player. He has great potential, but it is more likely, I suppose, that he will join a gang. I told the kids that I hoped that someday they would come play lacrosse in the United States. Yohanna came up to me afterwards and asked in Spanish when she could go to the United States. I knew if I told her five years that would be beyond the reach of any 12 year old. I told her one year. She stormed away disappointed. I guess that seemed like a lifetime to her. One social worker with the program related a story about a family that had to choose between paying 220 Quetzales for the medication they needed for their child or 180 Quetzales for a coffin. They chose the less expensive option. Graduation from 8th grade, or even better, high school, probably means that a student can get a job that makes enough money to move his or her whole family out of the environs of the dump. Perhaps the slight extra confidence and purpose they may develop from playing on a lacrosse team will help them graduate from 8th grade and help them move their whole family to a new life with less crime and less disease and more hope. That has to feel pretty good! Hanley Denning and all the others at Safe Passage share our hope and commitment to see this lacrosse program and these opportunities continue to grow for the 55 boys and girls that played lacrosse last week, and for many others. They will be playing this week and in weeks to come. Hanley and I discussed employing a sports coordinator to keep this and other sports programs growing. That would cost $250 per month. We talked about bussing the players and their parents to a stadium so they could play on turf or grass just once, instead of on dirt and rocks and trash. As you might guess, that would be a very big deal for these kids. We talked about bringing some kids to the U.S. for a lacrosse camp in the future. I am and we are committed to seeing this program stay in he lives of these children. It must not be a mirage. We hope that Maine lacrosse players and coaches will go to Guatemala in the future to help out. 55 kids played lacrosse last week. Many more are waiting for more Maine lacrosse players to come down today and tomorrow and in the months and years ahead. It is a great experience and it is amazing how little it takes to do so much for these children. Anyone interested in supporting the growth of the lacrosse program for children living around the Guatemala City Dump can contact Bob Stuart at bstuart@yecinc.com. James R. McCue & Associates, Inc.